I have TWO author-type events on this coming Tuesday. My FIRST two author-type events. I’m not nervous (she says with a laugh that fools no one). I’m wicked excited (this is actually true). I give good hugs (feel free to request/demand/prepare yourself to receive one). 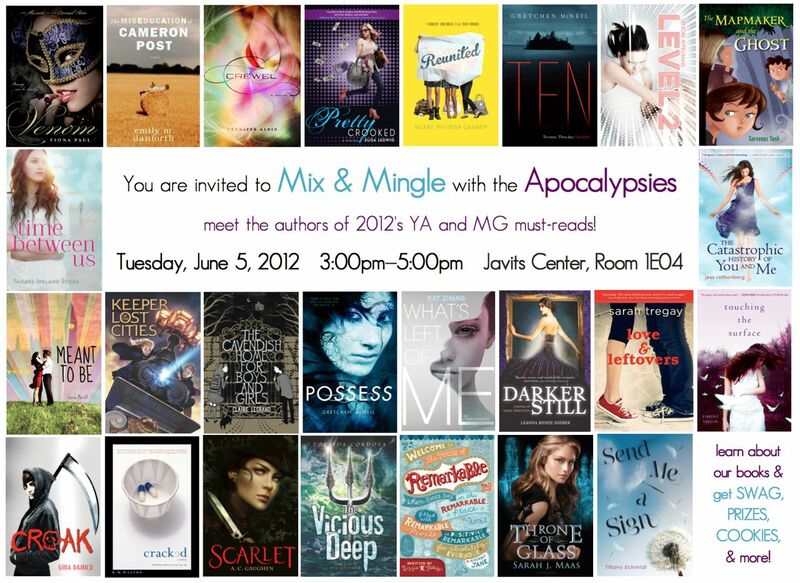 If you’re going to be at BEA, I hope the Apocalypsie Mix & Mingle has made your schedule! Do you see all the amazing covers below? The amazing authors whose stories live behind them will ALL be there for your mix & mingling pleasure. 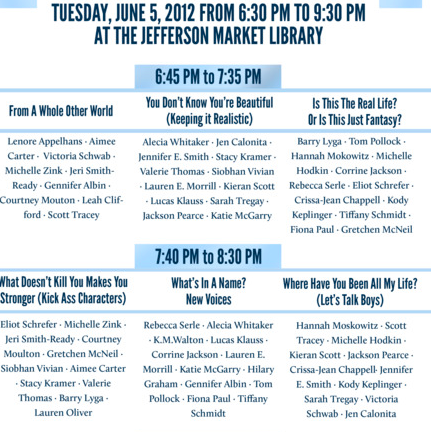 And then, after you’ve mixed & mingled (and grabbed something to eat) I hope you plan to zip over to the Jefferson Market Library for the Teen Author Carnival. Check out these panels. Let’s all take a moment to pretend I won’t be too busy grinning like a fool to contribute to the conversation… actually, that’s not true. I’m too chatterboxy to stay quiet. At both locations I’ll have plenty of Send Me A Sign swag and hugs to go around. Tiffany, this is so exciting!! I will hopefully be at both events (though there I have bunch of conflicts during the Apocalypsie Mix & Mingle so I might not be there for the entire time). See you on Tuesday! I can’t wait to see you, Lisa!